A little while ago, I ordered the FabFitFun box. I had a rough week and decided to treat myself to something fun. 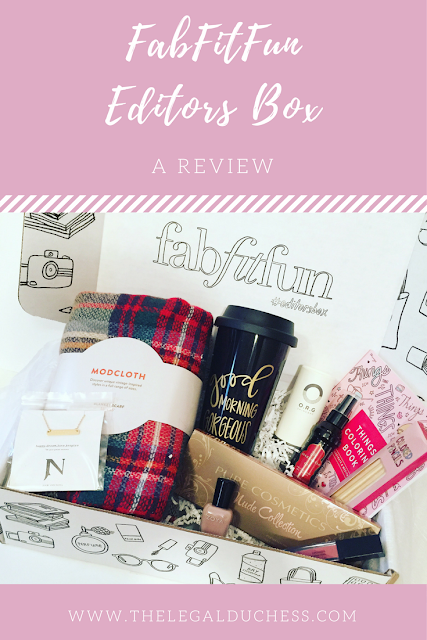 FabFitFun is a seasonal subscription box full of goodies. You pay just $49.99 for $200+ worth of products. Products vary but all are of good quality and super fun. My box came earlier this week and I have had a chance to try out the products so I can give an honest review! I LOVE blanket scarfs. So warm, cozy and adorable. I wear them all the time during the winter. This one does not fail; it is cute, soft, huge and so cozy. I actually already have a similar patterned blanket scarf so I am thinking I will use this one as a blanket for my desk chair or give it as a birthday gift to a friend. There is always a use for a nice blanket scarf. So. cute. I take coffee with me everywhere and I use travel mugs like it's my job. This one is light, holds heat well and is just so dang cute. I took it to Constitutional Law the day after getting it and got so many compliments. My only complaint is that I wish it closed all the way but thankfully I don't spill my coffee too often (I drink it too fast to have a chance to spill it). I have been wanting a bar style necklace so this was a fun surprise. It is very high quality (valued at $60!) and is so darn cute. I love little inspirational jewelry pieces like this... everyone can use a reminder to be "happy". Oh this stuff... it's amaze-balls. 1) it smells fantastic 2) it makes your hair feel SO soft and 3) it does not weigh the hair down at all. I have to be very careful about oils in my hair because it is very thin and naturally oily. This is one of few oils I was super happy with. Love it! This was fun to try- I have never done a face peel before. It was a little weird to have my skin flaking off as I rubbed but it did feel SO soft afterward. This stuff is fan-crapping-tastic. It's a lovely basic shade and stays on SO well. I also love that it retains a bit of glossy look. I have been wearing it every day since I got it... addicted. Zoya is such a great polish brand- I love how natural it is! It also stays on great, has fantastic pigmentation and comes in the cutest colors. The color in the box is a nice soft pink- perfect for spring and formal events (cough*cough* legal interviews). This was my "surprise" item and I was so happy to receive it. I have been needed a new eye shadow pallet and I never wear anything but nudes (I know, I'm boring). This is such a great palette- comparable to Naked. The colors go on great, stay on great and look amazing. I have been also wearing this every day. This came right before spring break so I had some time to relax. I do love to color- it takes me back to childhood and relaxes my busy mind. This cute little book fits easily in my purse and is just adorable. Overall, I love this box. It was such a fun little pick-me-up full of fun goodies. I would highly recommend!